In Algeria, the siltation phenomenon affects all dams. Million cubic meters of sediments are deposited annually. A research program is developed for a rational use of dredged sediments. This study aims to develop sediment management methodology and valorization of dredged materials in western region of Algeria. 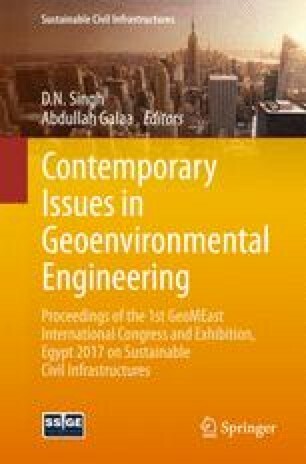 Experimental results are presented for the exploitation of dredged sediments and its potential uses as a new material resource for road engineering. The goal is to provide formulations economically competitive and easy to implement in situ. The paper is composed of two parts. The first one presents the geotechnical characteristics of the dredged sediment. The second provides an analysis of the experimental results and discusses the influence of physico-chemical treatment composed of a size particle correction and treatment with binders on the compaction properties and bearing capacity of the material as well as its durability. The results analysis show that the addition of lime influences the plasticity of material which is clearly decreases (55%). An improvement of the dry density is also observed (25%), which indicating an acceptable level of compactness. The bearing capacity indices are significantly improved after treatment and continue to increase with lower water contents. The values of bearing capacity are ranging from 34–42%, acceptable values according to the technical guide (IIBCR > 25%), and sufficient to use in the pavement layers. The compressive strength increases with the curing time or a significant increase appears for the lime treated sediment from a cure period of 28 days and the minimal strength criterion (1 MPa) set by the technical guide to allow trafficability on the treated layers is reached before seven days of curing time. This increasing of the curing time also improves the elastic modulus which indicated that the curing time affected the compressive strength and elastic modulus.